Very large, spacious, well equipped and furnished to a high standard. This villa with private solar heated pool, a well equipped games room and Free WIFI, is situated on an exclusive, sought after and established development, yet is within a pleasant 10 minute leisurely stroll to the historic centre and heart of Tavira, the river Gilao, the historic Roman Bridge, 13th century castle and churches, the many excellent traditional and seafood restaurants, pavement cafes and bars. Perfect for those seeking a high quality, private and tranquil environment, yet being close enough to enjoy the attractions of Tavira and the wider Algarve. 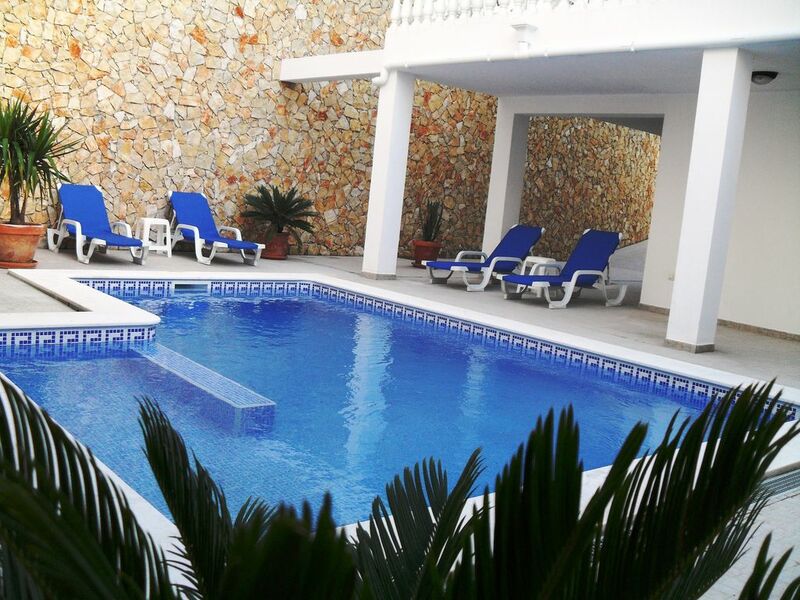 The property is suitable for visits all year round, being very large, light, spacious, well appointed and comfortable, benefiting from air conditioning units in all bedrooms and main living areas. Located in a very calm, quiet, peaceful and safe area on a large, private plot. Excellent for doing your own thing, to chill out, totally relax, wind down, de-stress and for topping up your tan. A safe, totally enclosed, very private and peaceful property, with gated access to the front, leading onto a tiled front sun terrace complete with a fixed outdoor granite dining table and seating benches. On entering the villa you immediately get a feel for how large, spacious and well cared for the property is throughout. The spacious lounge is furnished to a very high standard, with quality leather sofa and chairs, large 40inch LED Flat Screen HD TV, complete with English TV & Radio Channels, plus a DVD player. The lounge also has a separate formal dining area with full English oak dining suite, seating 8 people and a feature, focal point, marble fireplace with wood burner stove. From the dining and lounge areas you have direct access through double sliding patio doors, outside onto a sun terrace, complete with comfortable outdoor seating that looks onto your very own private swimming pool. The lounge also gives direct access through into the very spacious, light and modern, fitted breakfast kitchen, complete with a range of modern units in gloss white and integrated appliances incorporating granite worktops, 4 ring mains gas hob and fan assisted electric oven with extractor hood. The kitchen benefits from a double sink unit and drainer, dishwasher, microwave oven, tall fridge freezer, kettle and a CD – radio. Adequate crockery, cooking utensils, glasses etc. are provided to suit all of your needs. There is a separate laundry room, fitted with a range of base units and granite worktops fully equipped with sink, automatic washing machine, tumble dryer, clothes airer, ironing board and steam iron. Situated off from the main entrance vestibule and hallway is a fully tiled WC and Shower room. A staircase leads you up to the light and spacious, first floor galleried landing where you find all 3 very large double sized bedrooms: Bedroom 1 - Master Double Bed - with dressing room and large fully tiled en-suite full bathroom, encorporating twin sinks and vanity units with feature marble tops, WC, bidet, shower and full sized Jacuzzi bath. Bedroom 2 - Double Bed. Bedroom 3 - Twin room (2 single beds). There is also a large fully tiled full house bathroom, complete with full sized bath, WC, bidet, sink , vanity unit with feature marble top and shower, located off the gallaried landing and adjacent to bedrooms 2 and 3. All 3 bedrooms (Master with en-suite and a dressing room), are very large and comfortable, fitted with built in wardrobes, quality furniture, hairdryers and ample storage for clothes and personal items. All bedrooms benefit from full cooling and heating air-conditioning. Quality Egyptian Cotton Bed linen and ample towels are provided. All bedrooms benefit from full length Patio Windows, which give access onto large furnished balconies, with either sea or countryside views over Pool and Quinta. Perfect for watching the sun going down with a glass of wine! To the rear of the property is a large full width sun terrace and seating area, which is accessible directly from the kitchen and also from the lounge, via double patio doors. Steps gently lead down onto a large, sun drenched, tiled sun terrace and Swimming Pool area with access into the covered Built in BBQ, cooking and al fresco dining area. The 6mtr x 5mtr Swimming Pool was newlly built in 2015 and was specially designed to cater for the needs of all of our guests. Gentle steps lead down into the water and into an extra shallow, child and non-swimmer friendly section (just 0.7mtrs deep), to the side of the main pool area. This makes it ideal for families with younger children and all non swimmers alike, ensuring that they can also play, relax, bask and cool off in the warm water along with everyone else. From this section a small step leads you down into the shallow end of the main pool which has a traditional shallow and deep end design ( the shallow end being 0.9 mtrs with a gentle slope down to the deep end at 1.75 mtrs deep). The Pool also benefits from a solar pool heating system for additional bather comfort all year round. The Pool house has also been specially sound proofed to ensure a tranquil and relaxing environment at all times, whilst you are enjoying the pool, sun terraces and the outdoor areas. There is also a wide assortment of lilos, inflatables and pool toys for your use and amusement during your stay. For the really serious sun worshipers there is a further large, private raised sun terrace, next to the pool which is accessed via gentle steps. There is ample outside furniture and sun loungers to ensure guests can fully relax, wind down & really enjoy their stay. The property has been designed with excellent mix of both sun and shaded areas. Adjacent to, and leading straight on to the Pool side via patio doors is the large Games Room, with professional Pool and Bar Football Tables. This room is very popular with all of our guests, being by the side of the Pool. The Games Room is furnished and has a large comfortable corner sofer, table and chairs, it also benefits from a Music Centre (CD and Radio) with an auxillary lead so that our guests can connect their own devices and music. The music is also piped outdoors via speakers to the private pool, sun bathing, dining and BBQ areas ensuring you can listen to your favourite tunes, whilst relaxing during the day or enjoying a more lively party atmosphere at night around the BBQ and pool ! There is a good assortment CD’s to suit all age groups, a wide selection of Board Games, as well as a library of popular best seller books and a DVD library to suit all age groups are available for your additional pleasure and entertainment. There is also a separate area with a professional style boxing bag with training gloves and exercise mats etc. First Aid Kits, basic medicines and Safety Equipment is on site and available for your added safety. The Villa is fully equipped with everything to make your holiday very comfortable and as enjoyable and stress free as possible. In order to get your holiday experience off to a good start, a supply of fresh tea, coffee, and the basic condiments are provided, as is washing up liqiud, hand wash, dish washer tablets, washing powder and loo rolls etc. Likewise BBQ fuel and lighters, All we would ask is that you replenish as necessary. Cleaning / Towels / Linen / Maid service: The property will be cleaned and prepared for your arrival. Freshly laundered Egyptian cotton bed linen and towels are provided and changed weekly. Beach towels, shopping & additional services can be arranged upon request at a very reasonable local rate. Assistance and advice can be provided, regarding hire cars and airport transfers. Likewise in terms of local area information, events, recommended restaurants, Cafes and bars. Please do not hesitate to contact us should you require any further information or assistance whatsoever. Hi, from Julie & Paul. We have owned our property in Tavira for several years now. We purchased it after searching around the globe for many years to find our own piece of paradise. As soon as we visited Tavira we simply fell in love with the unique, authentic, quaint, unspoilt and vibrant atmosphere of the place & its charming friendly people. We knew straight away that this was the perfect place for our family and went out to find our perfect home from home and furnish it to ensure our every comfort. The villa has been furnished to a high standard purely for our own personal use. (Not as a holiday let). We now wish for others to discover and enjoy this unique, idyllic place. We aim to do all we can to ensure our guests, chill out, relax, enjoy their visit and fall in love with Tavira. A spacious, high quality, well equipped, modern villa benefitting from a very calm, private location with its own private swimming pool and professionally equipped games room. The property has an excellent location in Tavira and is conveniently located, just a short walk to the very centre of Tavira Town, Bishops Square, the historic Roman Bridge and the many Restaurants, Cafe's, Bars, the Castle and many churches and tourist attractions / historic buildings etc. This is a modern built, very spacious and well equipped property, located very close and within walking distance to the historic centre of Tavira Town. Excellent Solar Heated Swimming Pool and Games Room, including Pool and Bar Football tables and an audio centre, with music being piped outside to the swimming pool and surrounding terraces. The ouside space is well planned, providing both sunny and shaded areas to suit individual preferences. Bathroom 1. Ensiute to bedroom 1 with twin sinks, Jacuzzi spa bath and shower, wc, bidet and vanity unit. Bathroom 2. Bath, shower, WC, bidet, sink and vanity unit. Bathroom 3. Ground floor, shower, WC, sink and vanity unit. All bathrooms are spacious and fully tiled. Free WIFI is installed and available to guests during their stay in order to keep up with emails and what is going on back home etc. The Access Code is provided on arrival. The property benefits from a wood burning stove, which is a focal point to the main lounge area. Large spacious comfortable lounge, furnished with quality leather sofa and matching chairs, large flat screen TV with English free-view channels, DVD, CD player, large English oak dining suite with dining table to seat 8 people, wood burner and air-con. Large and well equipped with modern units, integrated appliances, double sink and granite worktops. Equipment includes electric oven, 4 ring gas hob, dishwasher, microwave, toaster, large fridge-freezer, table and 6 chairs. Access out onto large balcony. There are two formal dining areas. One is situated inside the property which seats up to 8 people. The second is situated outside adjacent to the Swimming Pool and BBQ area and seats 6 people. Bikes are readilily available for hire at several places near by in Tavira. Tavira is an ideal location for hiring bikes and exploring. Boat Tours and Trips are readily available in Town by the waterside. Catering for all needs and tastes. Dofin spotting , Pleasure boat cruises, fishing and big game fishing etc. The Villa is an ideal, comfortable base for golf lovers due to the properties great location and its facilities. With numerous magnificent championship and award winning golf courses all being available within a short drive, with Benamor, Quinta da Cima and Quinta da Ria all being just 5 minutes away and the spectacular Monte Rei golf and country club a mere 15 minute drive. A little further a field heading East towards Spain is the excellent Castro Marim (20 minute drive) and just over the boarder in Spain is Esturi (25 minute drive). Further courses are available, heading West to Faro, Central and Western Algarve. However, with this fine array of courses on offer just a stones throw away from the villa you really will be spoilt for choice! After an enjoyable round or two you can return to the villa - The 19th hole and enjoy a cold refreshing drink or two as the sun goes down! Ample secure, storage space for all your golfing equipment is on site at the property. Notes on accommodation: Fully Licenced & Compliant. Portuguese Rental Licence Number: 9672/AL The property is suitable for visits all year round, being very large, light, spacious, well appointed and comfortable. Located in a very calm, quiet, peaceful and safe area on a private plot and a sought after development. Excellent for doing your own thing, to chill out, totally relax, wind down, de-stress and for topping up your tan. All bedrooms are very large, fitted with built in wardrobes, quality furniture, hairdryers and ample storage for clothes and personal items. All bedrooms and living areas are fitted with full cooling and heating air-conditioning. The lounge also has a feature focal point wood burner stove for winter stays. Large Games Room, with professional pool table & bar football table plus an assortment of DVDs, CDs, Board Games & Books are available for your entertainment. First Aid Kit, basic medicines. Villa is fully equipped with everything to make your stay very comfortable. Outside: A safe, totally enclosed, very private and peaceful property, with gated access to the front of the property leading onto a tiled front sun terrace complete with a fixed outdoor granite dining table and seating benches. To the rear of the property is a large full width sun terrace, which is accessible directly from the lounge, via double patio doors and also from the kitchen. Steps gently lead down onto a large, sun drenched, tiled courtyard/patio and pool area with access into the covered BBQ, cooking and al fresco dining area. For the really serious sun worshipers there is a further large, private sun terrace at high level accessed via gentle steps. There is ample outside furniture to ensure guests can fully relax, wind down & really enjoy their stay. An excellent mix of sun and shaded areas. All bedrooms have access onto large furnished balconies with either sea or countryside views over rear courtyard, pool & Quinta. Perfect for watching the sun going down with a glass of wine! Utility Room: Separate laundry room, fitted with a range of base units and granite worktops fully equipped with sink, washing machine, tumble dryer, clothes airer, ironing board and steam iron. Cleaning / Towels / Linen / Maid service: The property will be cleaned and prepared for your arrival. Freshly laundered egyptian cotton bed linen and towels are provided and changed weekly. Beach towels, shopping & additional services can be arranged upon request at a very reasonable local rate. Other: A large fully equipped games room, including professional pool & bar football tables, library, music centre and patio doors, providing access onto the side & rear courtyards, sun terraces & private pool. Ample storage space for sports equipment etc. Well equipped comfortable house with excellent facilities. Excellent house for our family. The house was clean and the kitchen well stocked. The beds were very comfortable. The children enjoyed the pool and the indoor games room with a pool table and table football. The outdoor kitchen area was great to relax in watching the children play. It suited our needs. I would recommend a car in order to explore the local area. The beeches were lovely and at this time of year not crowded. We had a great week. Would definitely recommend it. This lovely house was extremely well equipped, with high quality furnishings and comfortable beds, and spotlessly clean. There were even hair straighteners! The welcome pack of milk, water, juice, beer and wine was a lovely touch and most welcome after a very early flight and long journey. It's located in a mostly quiet (apart from a few barking dogs and what sounded like leaf blowers) residential area within a 10 minute walk to the centre of Tavira, which offers a good selection of bars and restaurants at reasonable prices. Alas, it's not the most scenic jaunt and be prepared to cross a very busy road on your way into town. Sadly, I think we had chosen the wrong time of year to visit this accommodation, as the pool is located just off the ground floor at the rear - the house is built on a slope, so 2 storey at the front and 3 at the rear. As the sun is somewhat lower in the sky at that time of year (end October), you don't benefit from the warmth of the sun whilst swimming and, despite the solar hearing, the pool remained quite chilly. We did venture in for a splash around a few times though during late afternoon, but we didn't hang around! Catching the sun in the morning at the front of the house and on the further most terrace at the rear in the afternoon was no problem at all though - in fact it was a sun trap. Our favorite area was the fantastic games room which we enjoyed both during the day and evening - we'd not played pool and table football for ages so we thoroughly enjoyed our family games together, along with some 80s and 90s music thrown in. The owners Paul and Julie communicated well via phone, email and text prior to our holiday, and they provided us with some useful tips about places to visit. The red information folder at the house was extremely useful too. The beaches around this area are amazing and kept our teenage girls happy for a short time, but there wasn't really much more for them to do. We didn't opt to do the dolphin tour, but a lady on our return flight said it was very good as they saw a large pod. Sadly we didn't get to meet Paul and Julie during our stay, as we were dealt with by a management company instead (Casa Servico). Unfortunately I think they lacked some personal touch, which we feel sure we would have got from the owners. If we returned in the future, it would only be during the summer months. Tip: Don't leave a key on the inside of the front door when you pull it closed as you can't get back in again! We are deeply sorry that your holiday wasn't all that you had hoped for and that the weather this year was particularly poor and overcast at times and that the temperatures dropped dramatically overnight, which had a knock on effect with the pool temperatures and sadly tarnished your overall experience. However, that's always a risk out of the main season (October & November) any where in Europe. We do actually highlight the doors, locking and security procedures to guests in the information pack that we supply prior to arrival and again in the red information folder that is available in the property and can only say that we are sorry if you experienced a problem with locking yourselves out. We have been renting the villa for many years and our previous guests have always had a great holiday experience and have been able to enjoy the pool, even at the end of October / November, as reflected in our ratings and reviews. indeed we ourselves are normally able to use the pool daily mid march to mid November. Clearly it's not going to be anything like as warm as it is in say August. But is generally around at least 2 degree's warmer than any other non heated pools in the area. We also apologize if you felt that Casa Servico were un-responsive in any way. This is most unusual and normally is quite the opposite, as reflected by much face to face feedback and indeed guest reviews. We will certainly take your point on board and examine matters in this respect and provide your feedback to Casa Servico. We are genuinely sorry that you weren't fully happy with your experience and that the weather wasn't as good as it could have been and or if you feel we have let you down in any way, shape or form. We do work very hard to provide a quality holiday experience for our valued guests and take great pride in our 5 star ratings and guest reviews. Clearly we are deeply disappointed that our long standing, unblemished and exceptional 5 star rating record has been broken and that you felt that a 3 star more appropriate on this occasion. On a very personal note, this is particularly dissaponting to us as we do work hard and put a lot of effort into getting it right. We will of course reflect on all matters raised and continue to work hard to achieve continuous improvement in the service that we deliver, in an effort to provide a good quality environment and pleasant holiday experience to our valued guests. What's not to love about this property! I cannot recommend this property highly enough! It was perfect in every way. From the minute we arrived (There were 6 of us) everything was in place to make us feel at home. It is furnished to an exceptionally high standard throughout, and is so spacious and well maintained. There are numerous places to sit and relax outside and around the pool area, which also includes a barbecue area. The small attention to detail is what impressed our group most of all. Apart from everything you could wish for in terms of household appliances - kitchen equipment, laundry room etc, there were also a range of DVDs, Books, Games, a games room, and various accessories for the pool, lilo's/floats etc. It is perfectly situated on a quiet estate and is only a short walk into the town of Tavira itself. Even the neighbours were friendly and chatty on our daily jaunts into the town. Also included were suggestions on places to visit and recommendations on eateries and bars. So you are never short of something to do if you so wish, or you could just relax in the comfort of the villa which we did quite often. Although we were unable to meet in person on this occasion, due to problems with our airline cancelling our flight at short notice, I needed to speak to Paul by telephone a few times - I was a little anxious about arrangements and he could not have been more helpful and put me at my ease and even followed it up with texts to check all was ok.
All in all a definite must stay - you really do feel as if you have walked into a home rather than a house and the best compliment I can pay is to say all you need to take there is yourself! We would all stay again without hesitation. Everything was excellent there was nothing wanting. Superb house and wonderful hosts. 1st. Class. We enjoyed the comforts of the house mornings and nights after exploring the area by foot, train, bus and taxi. This is a place worth a visit for exploring or for relaxing. We have stayed in many, many villas over the years and can honestly say that this is the most well equipped one we have ever stayed in. The attention to detail, cleanliness and thoughtfulness of the owners, Paul and Julie Dove is quite simply, amazing! The welcome pack was very comprehensive, so much so that all the basic items one usually has to bring to a self catering villa were quite unnecessary, including my favourite Yorkshire teabags! Beach towels, parasols, hairdryers and much more were all provided and it is this thoughtfulness by Paul and Julie together with the lovely welcome we had when we arrived which made this such a great holiday. The walk into Tavira took about 10-15 minutes to walk and it was very easy to get a taxi back as there are taxi ranks dotted all round Tavira. This is a beautiful town with so many bars and restaurants to try and all at such reasonable prices that we ate in at the villa, only once. Finally, we must say, thank you to Paul and Julie for helping to make ours, a wonderful holiday and providing such a fantastic villa. We really enjoyed our stay in the Villa. Paul Dove the owner was so helpful and efficient. The Villa is beautiful, well kept and in a really good location. We stayed as a party of four and the villa is spacious, well equipped and perfect in every way. Paul and Julie Dove could not have been more helpful and organised for our food to be there on arrival. We would definitely go again and would recommend this villa. This coastal town has several unspoilt, beautiful sandy beaches all within just a few minutes’ drive, miniature train ride or short walk. Not to be missed, the idyllic ‘Ilha de Tavira,’ accessed via a short, pleasant, mini-ferry ride on the river Gilao, with its spectacular 11km stretch of white sun kissed, blue flag beach, fish restaurants and beach bars. Reputedly the best beach on the Algarve. It really is somehing quite special!! Tavira has several other wonderful beaches nearby at Barril, Cabanas. Manta Rota, is also excellent. Faro airport is just a 20 minute drive away. A hire car is not essential due to the good transport links. However is certainly useful. Nearest train station is just a 5 minute walk away, with regular trains along the Algarve. East to Villa Real San Antonio on the Spanish Border. An excellent days outing. Alternatively, travel West to Faro. You can even go on to Lisbon the Capital. The train stops at most towns along the coast. Nearest bus stop is a 5 minute walk with regular bus service. There is also a bus station close by in town with buses to and from many detinations in Portugal, the Agarve and Spain. Spain is just a 20 minute drive away. Tavira Centre with cafes, restaurants, bars, shops a pleasant 10 minute stroll away. Faro is 25 minute drive. Santa Luzia a 5 minute drive. Manta Rota and Fuzeta both a 10 - 15 minute drive. Ayemonte in Spain is a 20 minute drive accross an unrestricted border. Seville in Spain is just a 1.5 hour drive. Nearest shops and bakery are just a 5 minute walk. Several large branded supermarkets 5 to 10 minutes drive/Taxi. New large 'Gran Plaza' shopping Mall with designer shops and large Continente hypermarket, within a 5 minute drive or short walk. Tavira is an excellent safe and relaxed place for holiday makers. A brilliant base for golfers, cyclists and walking. A paradise for nature and bird lovers, with Tavira being located on the protected Ria Farmosa nature reserve, with it providing a rich habitat for 1,000's of beautiful & rare species of birds and plants. Storks, Pink and White Flamingoes and wading birds are common place, easily spotted, especially when on the mini ferry heading to the Island and beach. The beautiful sand dunes and beach at near by Manta Rota is another excellent and beautifull spot. Medical 24 hour SOS centre is a short walk / 5 minute drive away, with excellent facilities with medical doctors and dentistry on site. There are many Farmacies (Chemists) in Tavira. The nearest is a 10 minute walk away, located next to the Roman Bridge. All operate a 24 hour service on rota basis. There is an excellent sports, leisure, tennis and swimming centre a 10 minute walk away in Tavira. There are several travel agents and booking agencies in Tavira which organise coach trips, tours, activities and excursions locally. You can even travel to Gibraltar, Seville or Lisbon on organised excursions. Boat trips and big game fishing, water and Theme Parks. Water sports are available on the beaches in main season. Free organised professional entertainment is staged regularily out side in the main square/marble ampi theatre in Tavira in the evenings (accross the Roman bridge). These are excellent and varied. Opera, dancing, trapezee and specialist acts, rock, jazz and pop bands, top DJ's etc. Xmas and New Year in Tavira: Tavira prides itself on being a fantastic place to be at these special times. The entire town and Tavira county/region all turn out on New Years Eve and flock into Tavira Town. Gathering around the historic Roman bridge at midnight, with spectacular fireworks on the river. Organised free show ( live Bands and DJ's) in the ampi-theatre, with a real party atmospher and dancing in the streets untill the early hours. Night Clubs: Ubi's, & Mood. Booking Notes: Prices are "All Inclusive" with no hidden or additional charges to allow you to budget and plan your costs accordingly with no suprises. Longer Term Winter Booking from November to March inclusive, (minimum 30 days) - price is inclusive of all household bills. Payment: Secure & Convenient - Total Peace of Mind Booking Experience with Secure On - Line Payments via Credit Card: To pay online by Credit Card through Owners Direct: Click “ Request to Book” which includes their " Booking Insurance Scheme " which adds just 5-8% to the cost of the booking. This fee is automatically added to the quoted price and is shown as " Service Fee. " Owners Direct process the Credit Card Payment, retain the Insurance Service Fee element and transfer the balance into our account. This provides a seamless totally secure payment process and provides total peace of mind to guests booking their holiday. Deposit & Balance System (2 stage Payment): A 25% Non Refundable Deposit secures your booking. The Balance is due for payment a minimum of 8 weeks prior to your arrival. Where the booking is made less than 8 weeks prior to your arrival date, full payment is required at the time of making the booking. We also require a refundable £200 Security/Damage Deposit. Changeover Day: We are flexible with changeover days and times in order to accommodate our guests travel needs as best we can. Arrival is after 4 pm and the property is to be vacated by 10.00am. Our flexibility is dependant upon occupancy and we will do our very best to assist in accomodating early flight arrivals and late departure flights. Cancellation Policy: Deposit is Non Refundable. Where cancellation is prior to 65 days before arrival date 100% refund of the Balance element (if already paid). If cancelled less than 65 days prior to arrival date we will be unable to refund the balance. If we can re-let the property at short notice, we will refund 50% of Balance element.